Rhys Goldstein, Simon Breslav, Azam Khan. Using General Modeling Conventions for the Shared Development of Building Performance Simulation Software. In Proceedings of the International Building Performance Simulation Association. 2013. 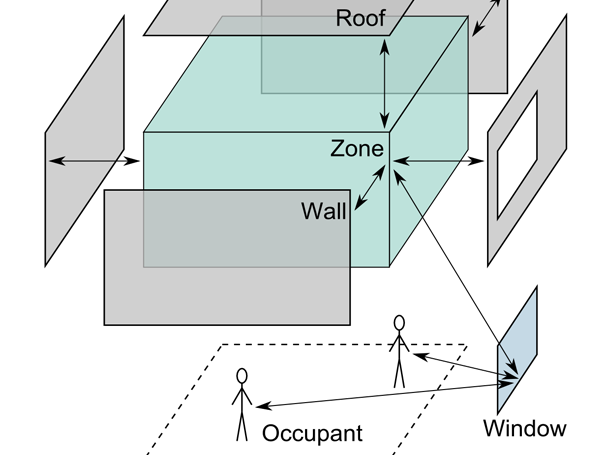 The building performance simulation community applies theory from several different fields to develop models for heat transfer, light propagation, human behavior, and other domains. To integrate these models, we propose the adoption of general modeling conventions from the less familiar field of modeling and simulation theory. The conventions we explore are known as the Discrete Event System Specification (DEVS). With DEVS, a model-independent simulator responsible for advancing time alleviates many of the technological difficulties involved in coupling models. We show how DEVS, from a mathematical perspective, accommodates the co-simulation strategies known as loose and strong coupling as well as strategies involving variable time steps. We also show how a model based on a functional decomposition of a system, as opposed to a topological decomposition, readily supports the sharing of domain-specific algorithms. The examples presented were implemented using Design-DEVS, an environment we created to help communities of researchers collaborate in the development of simulation software.